IMPULSO and its subsidiaries have a Code of Ethics and Social Responsibility that guides their activities and behavior both inside and outside the organization, whatever the geographical area or place where said activities are developed. IMPULSO not only requires its professionals to abide by this Code at all times, but will avoid establishing relations with any entity that is known to have incurred in a violation of the fundamental principles on which the Code is based and that govern ethical and socially responsible behavior. IMPULSO provides all its stakeholders with an Ethical Mailbox (rse@impulso.es) as a communication channel through which they can send questions and doubts about our Code of Ethics, and directly report any alleged breach of the principles that define it. The confidentiality and ethical treatment of the information received is guaranteed and will be analyzed by the Impulso Social Responsibility Committee, which will evaluate and decide on the appropriate treatment according to the nature of the events reported. A responsible use of the Mailbox and the provision of sufficient and truthful indications and evidence if reporting alleged breaches is recommended. We were pioneers in starting a daycare facility in the company’s premises for the employees’ children. Equality and labor flexibility policies. UNE-EN ISO 9001, Quality management system. UNE 166.002, R&D&i management system. Click here to Access our Complete management policy. IMPULSO has been a signatory of the United Nations Global Compact since late 2011 and a member of the Spanish Network, showing its commitment to the10 Principles of the Covenant, which it observes and supports. The progress made each year by IMPULSO in terms of corporate social responsibility and the 10 Principles of the Compact can be consulted in the Annual Progress Reports. Download our Progress Report on the 2014 Global Compact HERE. Download our Progress Report on the 2013 Global Compact HERE. Download our Progress Report on the 2012 Global Compact HERE. Download our Progress Report on the 2011 Global Compact HERE. IMPULSO has been a signatory of the Diversity Charter since the beginning of 2012, reaffirming its voluntary commitment to the principles of respect, equality, diversity and non-discrimination that define it. Partners of: Asturian Association of family businesses – AEFAS – Asturian Innovation Club, Association of Industrial Archeology, Cultural and Natural Heritage – INCUNA – Asturian Federation of Entrepreneurs – FADE – Federation of Metal and Associated Entrepreneurs of the Principality of Asturias – FEMETAL-, members of the Spanish Technological Platform of Fisheries and Aquaculture (PTEPA), Spanish Technological Platform of Sustainable Chemistry (SUSCHEM), International Association of Science and Technology Parks (IASP), Spanish Maritime Platform, members of the Aquacultural Engineering Society, Casa África, Chamber of Commerce of Spain in Peru. IMPULSO is approved by the United Nations Procurement Division (UNPD) as a potential provider of technical assistance services in engineering, architecture and consulting for its more complex and extensive works – level 4 -. IMPULSO is approved by the United Nations Development Program (UNDP) as a potential provider of technical assistance services in engineering, architecture and consulting for its work on the development of the most disadvantaged peoples. IMPULSO maintains agreements for the hiring of professionals with the University of Oviedo Foundation (FUO), the University of Navarre, the Integrated Vocational Training Center of Avilés and the Sculptor Juan de Villanueva secondary school of Pola de Siero. IMPULSO is a member of the European Water Technology Platform (WssTP). IMPULSO has been designated as an entity specialized in supporting companies for their participation in the European Union’s R&D Framework Program (Horizon 2020). 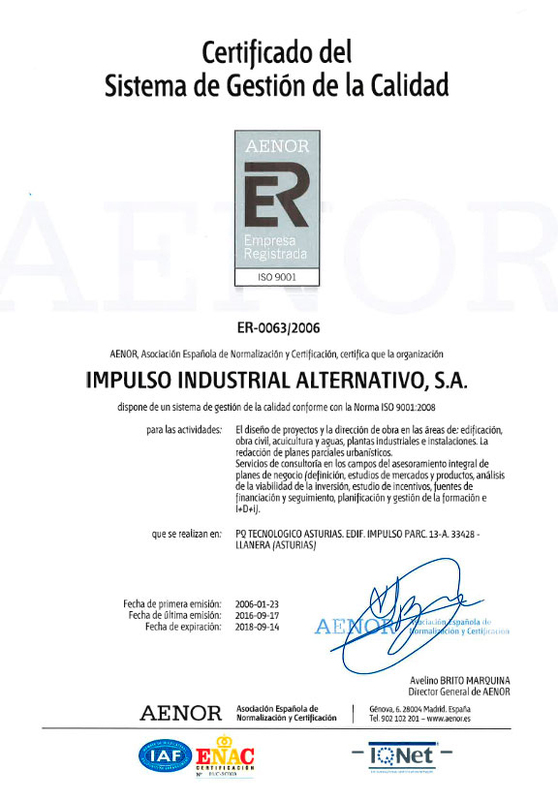 IMPULSO is part of the European Network of Experts in Technological Innovation, an initiative of InnoCámaras within the scope of the European CYBERINNOV program, whose objective is to bring technological innovation to small businesses as a means to achieve greater competitiveness.